The travel journal I did for my recent trip to Southern Africa is my all time favorite. I think the fact that I made the journal added to my pleasure in working in it. I used quite a bit of vintage ephemera I have collected online, using eBay and etsy primarily. I love adding old postcard, match box labels, travel ads and the like to my journals. This journal is a hodgepodge of writing, photos collected material. In the next few days I plan to share photos of each page. If these sorts of posts are not to your liking, you might want to ignore me until the new year. hope they enjoying seeing this newest of my travel journals. More in the next day or so! It looks a great journal, I would love to read it all. I bet it was fun making it and writing it. Wonderful journal pages, Shelley. I look forward to seeing them in more detail. 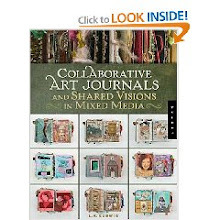 It is an amazing journal which I got to hold and look through about a week ago. Really terrific, Michele.